Discussion in 'PS4 & PS3' started by Phoenix8387, Jul 7, 2014. IGN has a month of first looks at Destiny this month. Today is some specifics on the beta and the Collectors Edition. The Beta will run from July 17th to 20th, coming down for maintenance on the 21st and returning on the 23rd for all consoles (Xbox included). Beta will end on midnight of the 26th. IGN will have around 10,000 keys to give away. -And the centerpiece: a life-size replica of the Ghost robot, complete with lights and Peter Dinklage dialogue samples. 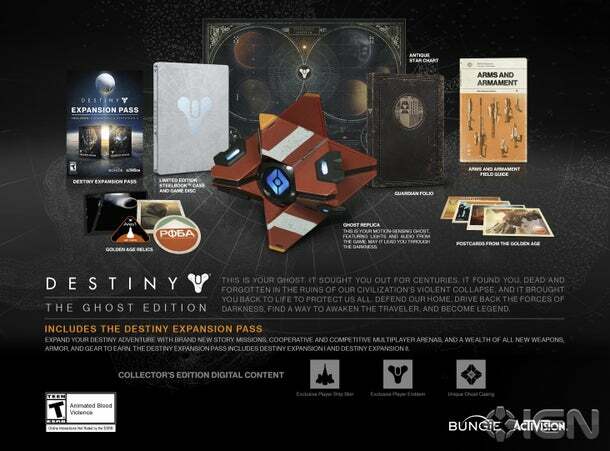 The Limited Edition will run $100 and will contain all of the above minus the Ghost replica. There is also a $90 Digital Guardian Edition which includes the game (digital), first two expansions, early access to Vanguard armory and player emblem pre-order bonuses and the CE digital content. Edit: and for you people who want a reward for playing the beta... If you play on the 26th you'll get an exclusive emblem for live.